Crispy Prosciutto di Parma perfectly complements the savory flavor of roasted squash in this creamy soup without overpowering it. 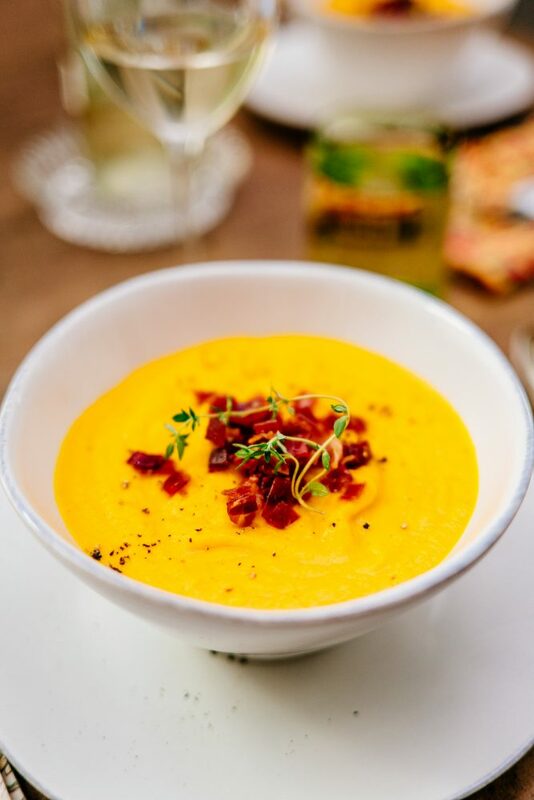 A perfect accompaniment to chilly afternoons and evenings, this Roasted Squash Soup with Crispy Prosciutto is comfort food at its finest. Pair a steaming bowl with some crusty bread for a warming cold-weather lunch, or serve alongside a main course and a brimming glass of red wine for a hearty dinner. Family and friends will love coming in from the cold with this comforting soup waiting for them. And if that’s not enough to convince you, this soup will taste even better as leftovers for the next day, as the flavors continue to meld overnight. Recipe originally featured on The Taste SF. Heat a sauté pan to medium heat and add the Prosciutto di Parma pieces, stirring often, until crispy. Remove and set aside. Cut the squash in half, scrape out the seeds, and coat with olive oil. Salt and pepper the inside and lay the two halves upside down on a sheet pan. Roast in the oven for 30-40 minutes, or until golden and caramelized. The flesh should pierce easily with a fork. Set aside and allow squash to cool. In Dutch oven, heat the butter and sauté the leeks. Add thyme and bay leaf. Season with a pinch of salt and pepper. Scoop out the flesh from the squash and add it to the Dutch oven, along with the stock. Simmer for 30 minutes. Remove any remaining thyme sprigs and the bay leaf. Use an immersion blender to puree the mixture. Return to the pan and thin slightly with vegetable stock if needed.